Two cab drivers in the city allegedly attempted suicide in front of Ola’s office in Murugeshpalya on Thursday. BENGALURU: Two cab drivers in the city allegedly attempted suicide in front of Ola’s office in Murugeshpalya on Thursday. 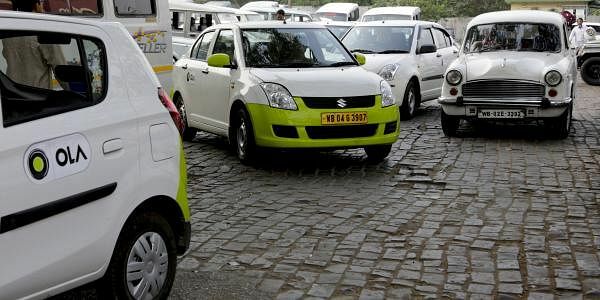 Sources say Ola, TaxiForSure and Uber (OTU) Drivers’ and Owners’ Union were staging a protest in front of the office on Thursday. Around 2:30 pm, Mohan Babu (35), an Ola driver, allegedly consumed toilet cleaning acid. He was rushed to Manipal Hospital. “Mohan was in a state of depression after he was unable to pay the EMI on his cab,” says Tanveer Pasha, president of OTU. Another Ola driver, Srinivas (28), also attempted suicide by trying to immolate himself. His suicide bid was foiled by other drivers. Pasha said Ola officials promised that their higher officials will reach Bengaluru on Tuesday and resolve the issue. “We will take action against Ola and drivers on charges of abetment of suicide,” said a police source.